Maui is one of hawaii's most sought after islands because of its ideal balance of beautiful beaches, lively night life and well established restaurant scene while also offering secluded, wild terrain for when you need some adventure. This was my first visit to hawaii and after plenty of research, maui seemed like the best island for my initiation into this popular vacation destination. In this guide you will have all you need to know before you go to the incredible island of maui. While our skepticism was high, that all quickly disappeared as we melted into Maui. It was like the second we stepped foot on the island it all made sense - the hype, the obsession, the shocked faces when they find out we've never been before - we just got it. Maui really is magical. So my goal is to share that magic with you. It's always hard planning a trip to a place you've never been and I ran into many questions and confusions when I was planning our first trip to Hawaii - what part of the island should I stay at? Should I spend time in different areas or just one? 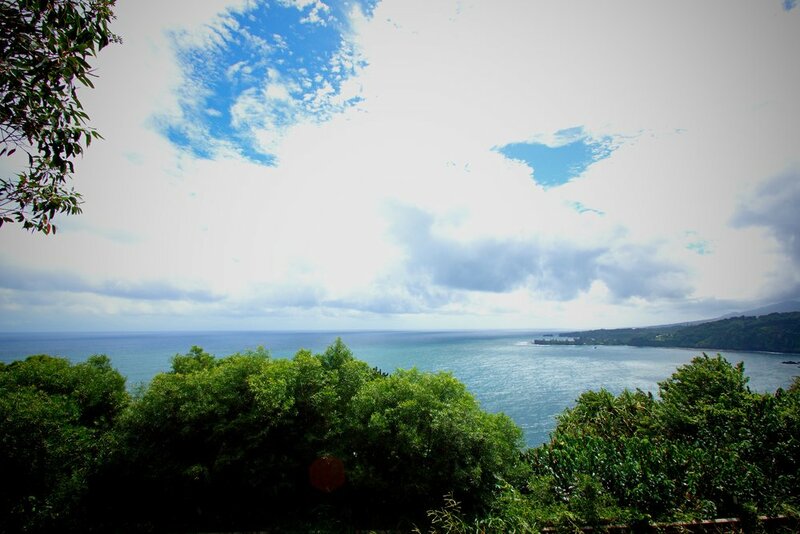 Can I do the Road to Hana in a day? Should I stay in a condo or a hotel? Do I really need a rental car? So many questions! I'm going to answer all of these plus provide some fabulous suggestions of what to see, do and eat along the way. Because this is such a popular travel destination, I received a ton of recommendations from from friends and family who have been visiting Hawaii for years and years. Equipped with their trustworthy advice and my own Type A research, you should have all you need to plan the perfect visit to Maui! One of the hardest parts of planning my trip was understanding where to stay on Maui. If you've never been, you quickly start to realize that there are resorts and condos all over the island and making a decision on where is best is nearly impossible. In order to provide you with trustworthy recommendations, I decided to stay in two different locations, plus drive the majority of the island. What I've discovered is that it all depends on what kind of vacation you want to have and the type of traveler you are. Here's my breakdown of where to stay on the island and why... and before I get angry comments from Maui experts, I ask that you please remember that these recommendations are from my experience as an outsider and my perspective only; I am not trying to pass them off as the end all, be all facts of the island. You know who you are - angry comment folks! 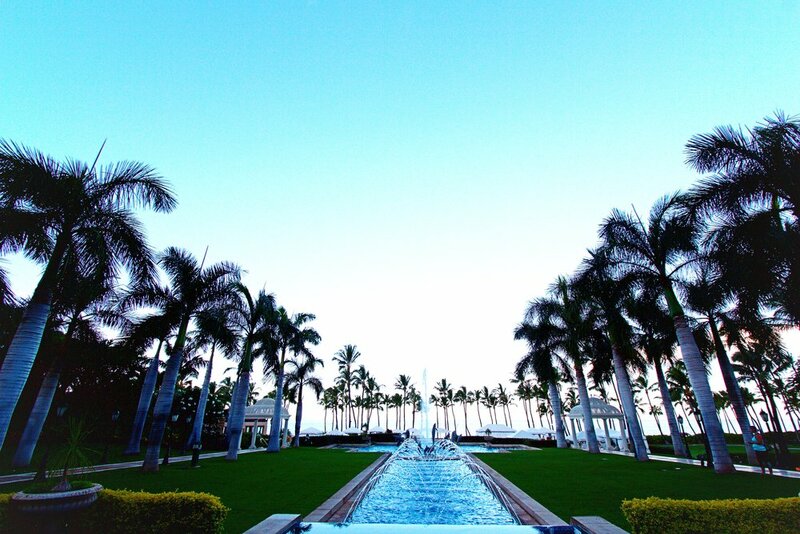 Maui's west shores are ridden with gorgeous beaches, high end hotels, condo communities and an active nightlife. Lahaina is Maui's most well known tourist town, with a lively downtown strip with dozens of restaurants, bars, clothing stores and of course a slew of unimpressive tourist traps. It is a nice area to go to often while on the island, but I would not suggest staying in downtown Lahaina. What can be confusing is that much of the surrounding area that you really should consider staying at is labeled as the city of Lahaina but is actually quite a few miles away from downtown, which is true all the way up through Kapalua. So keep this in mind as you are looking at addresses for where to stay - just because the city is listed as Lahaina, it's not necessarily in Lahaina so you'll really want to map it to see exactly where it is and realize that most places are not as far apart as they seem. Most major hotels along this western shore begin about 10 minutes north of downtown Lahaina toward Kaanapali. This area has largely mid range hotels like the Sheraton, Hyatt and the Marriott, has beautiful beaches and is a convenient location because of it's proximity to downtown. As you move a bit further north, between Kaanapali and Napili, you find a much larger population of vacation condos better suited for self service visitors who enjoy a relaxed, laid back vibe as well as more budget friendly options (about a 12-15 minute drive to downtown Lahaina). The beaches in this area are often rockier and not as luxurious as the perfectly groomed beaches that line the major hotels (which you can still visit at any time since all Hawaii beaches are public), but they are also less populated and quieter. Finally, as you move even further north near Kapalua is where you'll find a community of the island's luxury hotels including The Ritz Carlton and The Montage Kapalua Bay (20 minute drive from downtown Lahaina). This area is definitely the least populated area of the western shores, lush with pristine beaches with modern, classy accommodations. While there is a village of restaurants and shops here and located only about 10 minutes from Napili, it's still the farthest away from Lahaina so you really are concentrated to spending most of your time in this region unless you don't mind the drive. My husband and I spent five nights in a beach condo in Kaanapali which we absolutely loved. We found one on Airbnb that had an oceanfront view and a kitchen so we could make our own meals. The condo itself wasn't all that spectacular - clean and stocked appropriately with an early 90s vibe; however, the view from our 3rd story balcony was to die for. Within just 2 minutes I was on our private little stretch of beach just below to lay out or snorkel with the turtles floating by. My favorite part of Kaanapali is that everything you need is within a 5-10 minute drive or a very short walk - grocery stores, restaurants, nightlife in Lahaina, day hikes in the mountains and the beautiful Napili beaches were all at our fingertips. The only downfall was that it's about an hour away from the start of the Road to Hana, so it makes for an extra long day. As you know, Hawaii is expensive in general, so being able to make some of our meals saved us a lot of money, allowing us to splurge on nicer dinners when it was worth it. Being in a condo also made us feel more like we were living there rather than just tourists, helping us to feel even more at home than ever before. When we return to Maui, which we fully intend to in the near future, I would probably stick with finding a condo again in this area because we enjoyed it so much. 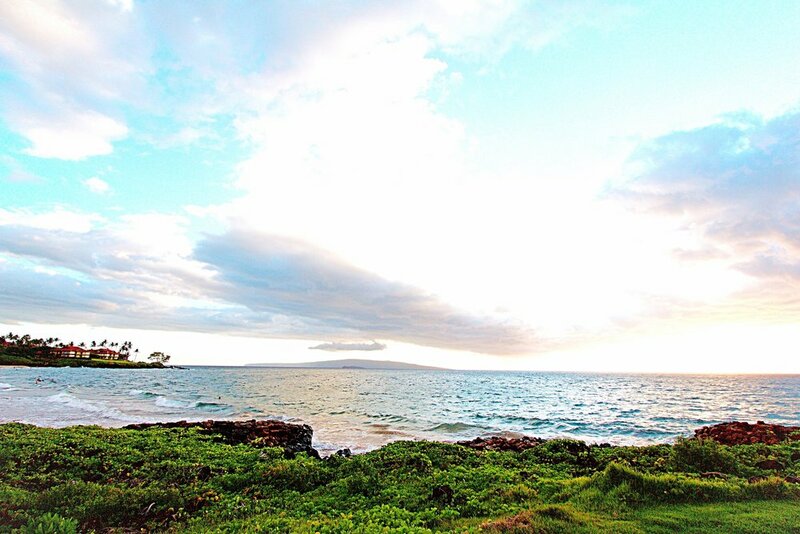 Maui's south shores stretch from Kihea and just beyond Wailea to Makena. Because of its drier climate, the south is touted as having some of the best beaches on the island and golf courses are plentiful in this region and highly sought after. Along the northern stretch near Kihea is closer to city life where you will find more budget friendly hotels and condos. As you travel further south into Wailea is where you will find a much larger, luxury hotel community that includes the Andaz, Grand Wailea and Hotel Wailea as well as multi million dollar real estate. Wailea definitely has more of a resort feel, with higher end restaurants and shops surrounding this region, but since it's only about a 15 minute drive to Kihea, local options are not far away. The drive to Wailea from the airport is a very easy 20-30 minutes, making it a fairly convenient location for exploring the island and starting the Road to Hana. My husband and I stayed at The Grand Wailea for two nights. Known as one of the best, if not the best hotel on Maui, we looked forward to the change of ambiance from the condo life that we experienced in Kaanapali. If you are truly seeking a resort destination, this delivers. Fresh leis to greet you, massive pools with numerous water slides, multiple restaurants, immaculate beaches with crystal clear water, high rises with ocean views and state of the art spa services are all part of this expansive property. While you are here you really don't ever need to leave as everything is at your fingertips. The spa experience here is pretty awesome and one to check out even if you don't purchase a specific treatment as the different aromatherapy pools and therapy areas are divine. While here on a Sunday we actually sat inside the pool's cave bar, equipped with serval televisions where we watched football all morning long - pretty epic if you ask me. Now those are the pros, but there are definitely some cons... with over 700 rooms, it's absolutely packed with families galore; from our ocean view suite it took about 10 minutes to get from our room to the beach due to the multiple elevators and expansive property to cross; spots at the pools and beach are super crowded; it's actually hard to leave because you have no option but to valet your car at an additional $30 per day plus tax and tips, which in turn causes you to eat at the hotel most days which is extremely pricey. In all honesty, it left me missing my quiet little condo we had where I prepared my own food and sat on my tiny beach watching the waves roll in. As I said, it really all depends on what kind of vacation you are looking to take and if I were in the mood for umbrella drinks and a resort vacation, I'd definitely return to The Grand Wailea, especially if we were traveling with kids. For an adults only getaway, I'd consider looking into a smaller, boutique hotel. As I mentioned before, this is a much less populated area of the island. 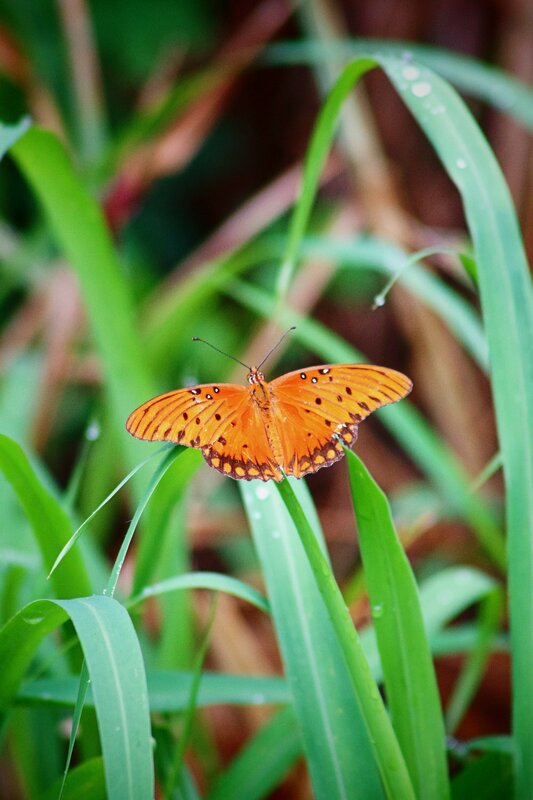 It's absolutely gorgeous, lush and adventurous - which has made the Road to Hana so famous (more on that below), but because of how desolate and hard to reach these areas are, most travelers prefer not to stay and simply do a day visit. 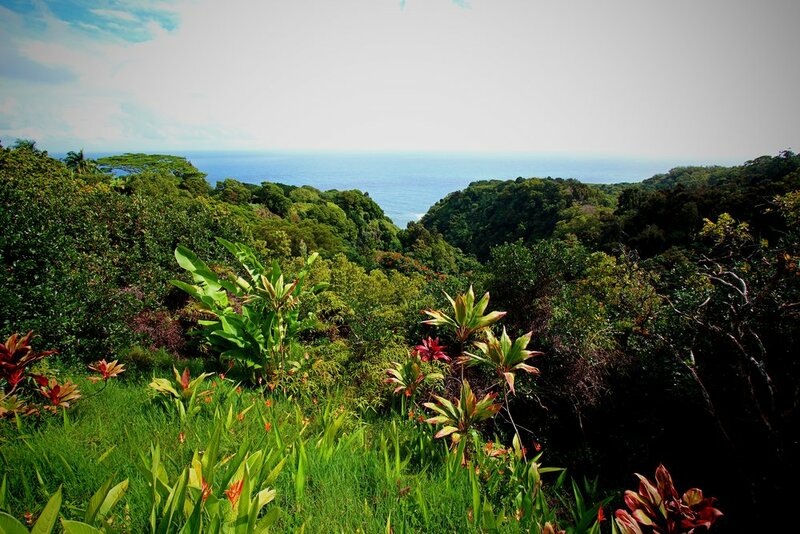 If you are looking for a quiet retreat to get away from it all or if you want to take more than a day to complete the Road to Hana, you can find a handful of small hotels and home rentals along this stretch. There is also a luxury resort called Travaasa located in Hana which offers an "all-inclusive" stay, with activities and meals and is one of the only options for a high end retreat in this part of Maui. While I did not get a chance to visit this particular resort, I did drive by on my way to Hana and there's a reason it provides an all inclusive stay - there's really not much to do in the sleepy town of Hana or much around it so keep that in mind. 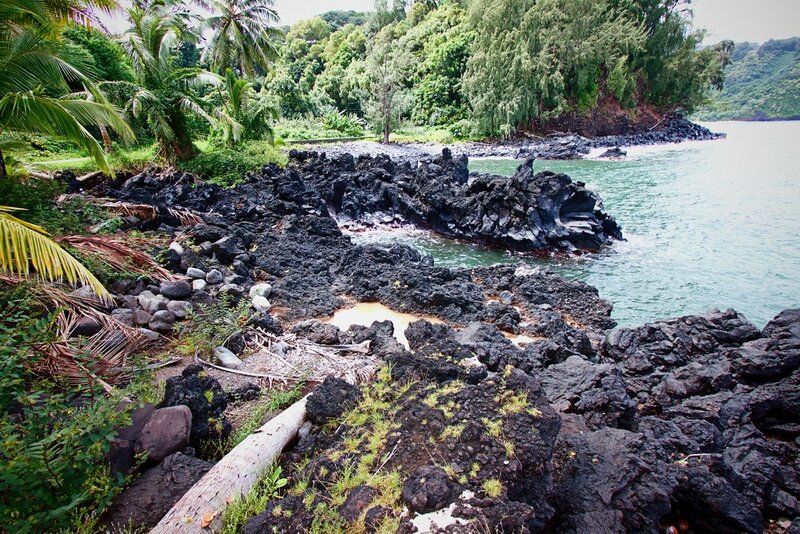 South of Hana to Kaupo is a loosely "off limits" part of the island. There's about 20 miles of off-roading that has to be done to reach civilization again and many rental car companies do not cover you as a driver - simply because if you were to break down or have a problem, it's going to take many hours for anyone to reach you and it will cost you a small fortune. I don't say this to scare you, it's just a fact. Many people have taken the risk and raved about the views along the drive from Hana to Wailea instead of looping back around, but it is a risk and will add time to your drive. As far as staying anywhere here - from my understanding, options are pretty much non-existent. The benefits of a staying in a condo include: budget friendly options, more space than a regular hotel room, a kitchen to cook meals, free parking (in most cases), close proximity to the beach, relaxed feel of home, less units so less people, a nice option if you plan on being out and about more than inside. The downside to choosing a condo include not being on the best beaches on Maui, having to be self sufficient such as taking out your own trash, washing your own dishes, etc., activities and accommodation options such as spas, bars and restaurants are not at your fingertips and you may have to leave often for more adventure. This really is the better option for those who don't mind being self sufficient. The benefits of staying in a hotel include: updated rooms, daily cleaning, round the clock services, on site restaurants, bars and spas (in most cases), premiere beach access, everything at your fingertips. On the other hand, the downside of a hotel is that it is often more expensive (especially if you want an ocean view), many hotels are rather large and are packed with people, the on site amenities like food and activities can be rather expensive, daily parking and resort fees add up quickly, increasing the overall cost. Hotels are better options for those who want to unpack and not think about a thing other than relaxing on the beach with a cold drink in one hand and sunscreen in the other, are willing to pay for the added convenience and don't plan on leaving all that often. Yes, you absolutely want to have a rental car during your time on Maui. Not only is the airport a decent drive away from anywhere you will probably be staying, there's also so many cool spots to visit around the island that would be too hard and too expensive to get to if you were relying on taxis and Uber. Driving around Maui is extremely easy. There are only a few main roads/highways so it feels nearly impossible to get lost and the only time you are encountering scary/sketchy driving is on the Road to Hana or if you are brave enough to take the north shore drive that I mentioned above. Otherwise, driving around the island is simple and having a car is the most convenient way to experience all that Maui has to offer. We chose to upgrade to a 4 wheel drive SUV since we arrived just after a major storm and were unsure of what the driving conditions would be like and in our opinion, the upgrade was not necessary. We didn't encounter any situations where it would have been necessary, so unless you are planning on going off the beaten path, any rental car would be sufficient for driving around the island. It's also important to mention that locals drive much faster than tourists, so just be sure to move over or pull over if you see a fast car approaching because they are probably trying to get to work and are not slowing down to soak in the scenery. It is strongly advised that you do not leave valuables in your car and definitely nothing that can be seen. Petty theft is common, especially in tourist areas, so break ins are common. Use common sense when parking your car and take anything important with you! Mind the speed limit signs. It was hard on open highways where cars seemed to be zooming by well beyond the speed limit, but there are plenty of cops out just waiting to nab impatient tourists. Move or pull over for local drivers when it's safe to do so. This will save you stress and anxiety from having an angry driver behind you for miles upon miles - it's worth repeating! Maui is typical of any tourist destination - there are a wide range of food options; some amazing, some not-so-amazing, some downright a rip off and some hidden gems if you are willing to venture off the beaten path. I was lucky enough to gather a large list of restaurants from friends who have been visiting Maui and who have lived there, plus adding a few of my own finds, so this list is pretty reliable. If it's listed here, I've tried it myself, with exception to a few that I specify, mainly because we simply ran out of time. These are listed by area, from north to south - but you can also check out my Tripcipe map below so you can see exactly where each one is on the island. Da Kitchen is one of your best stops coming into Maui or going out as it’s less than 5 minutes from the Kahului Airport. 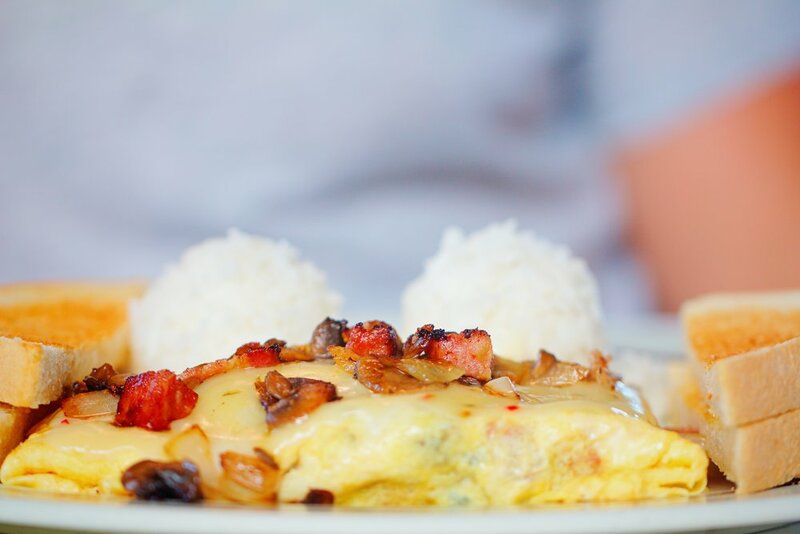 At reasonable prices and large portions, Da Kitchen is popular for their take on Loco Moco - a super rich, traditional Hawaiian dish made of white rice, meat, eggs and gravy. Of course there are many variations of this and Da Kitchen offers quite a few on their menu. We ordered the Notorious B.I.G. Moco, and they aren’t lying about the BIG - we could barely finish it between the two of us, but oh man was it delicious. 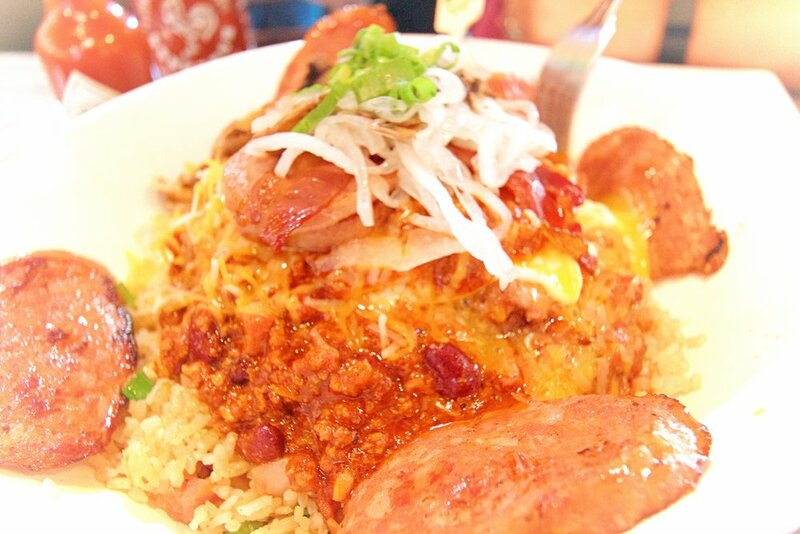 A massive bowl of hamburger, chili, 2 perfectly cooked over easy eggs, mushrooms, onions, spam, cheese, bacon and Portuguese sausage over fried rice was a sumptuous Maui smack in the belly - we couldn’t get enough. But we couldn’t just try one thing - we also got an order of the Fried Spam Musubi - spam surrounded in white rice, wrapped in seaweed, battered and deep fried and dipped in some kind of heavenly sweet sauce. It wasn’t until after we ordered that we realized that these dishes have been featured on several famous food shows, and we quickly understood why; one bite and you’re immediately hooked! They also have an extensive gluten free menu in case you were wondering. This is a small, casual sit down restaurant in a strip mall that is popular with locals and travelers alike so it can get pretty packed around lunch time. If you get there around 11:30 you shouldn’t have a problem getting in and out in less than 45 minutes - this place moves quick. Keep in mind the Kahului location is closed on Sundays and there is an express location in Kihei. Mama’s Fish House is an absolute staple on Maui - literally every person I asked recommended this restaurant so of course we had to check it out. Since you pass it leaving the Road to Hana, we decided to make a stop for dinner on our way home from a very long day of exploring. Clearly, I did not do my research because this isn’t just some random fish house on the outskirts of town - it’s a massive operation and was completely packed when we arrived on a Friday evening. When we drove up I asked the valet 1) if we were dressed appropriately (literally in semi-wet shorts and t-shirts) and 2)if we could even get a table. He was so sweet and said we were perfectly dressed (a bit of an exaggeration) and he called inside and they said they could get us in within 15 minutes! After dusting ourselves off of sand and attempting to look as presentable as possible, we walked through the bamboo arches onto a picturesque beach lined with tiki torches, straight out of a scene from a movie. There were a range of guests from super casual shorts and tees to those dressed for a night out - I even saw a woman in a wedding gown! But no one seemed to bat an eye at us so casual to semi casual attire appeared perfectly appropriate. After checking in at the front desk, we were seated fairly quickly. The restaurant was bustling - hundreds of guests and what seemed to be just as many staff. We were seated, in what I’m assuming, is their “no reservation” section, which was just fine. There are a number of tables along the window facing the beach, but not many so don’t expect to land one of these sought after spots even if you request one as we heard nearly everyone do upon checking in with the hostess. The restaurant is completely open on the sides, so there can be a slight breeze on cooler nights - you should definitely bring a light jacket just in case. Our server Sasha was delightful and was one of the most memorable parts of our evening (for me, quality food and service/kindness are equally as important - you can't have one without the other); so patient and attentive - explaining every dish on the menu. Here’s where my lack of research hit me again - wow was it pricey! Main entrees averaged around $48-52 and went up to $95 for the surf and turf, which came as a shock because tonight was going to be our “cheap” night. Oops. Maui is expensive in general, but this is definitely on the higher end. 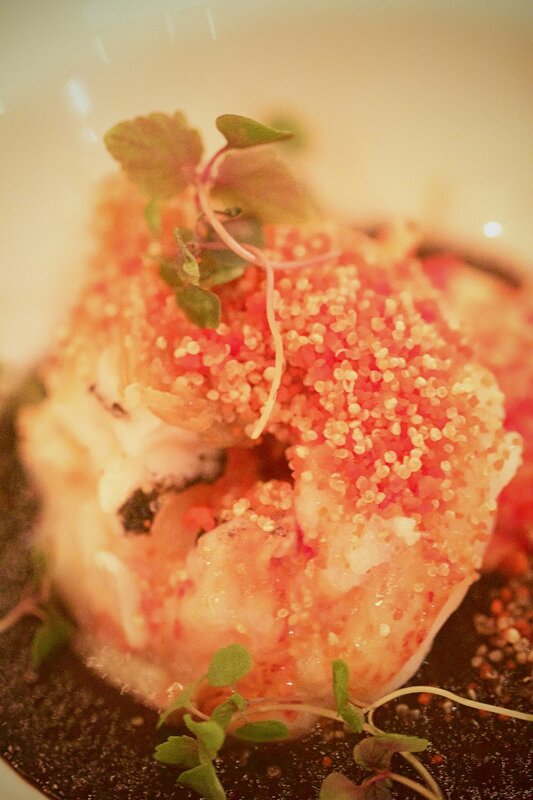 Saying that, their food is very well executed with the highest quality of fresh fish caught within the last 24 hours and highlighting local, seasonal Hawaiian ingredients. We decided to just go for it so we ordered the Macadamia Nut Crab Cakes ($25) as an appetizer, the Traditional Hawaiian ($52) and the Uku for entrees, the Kuau Chocolate Pie ($15) for dessert and one non-alcoholic umbrella drink ($10). Everything was delicious and perfectly prepared. I especially enjoyed the Traditional Hawaiian as it was a well plated sampling of traditional dishes that I probably wouldn’t have had the opportunity to try otherwise, including fresh poi which I found surprisingly pleasant (many would disagree, it must be the Asian in me). 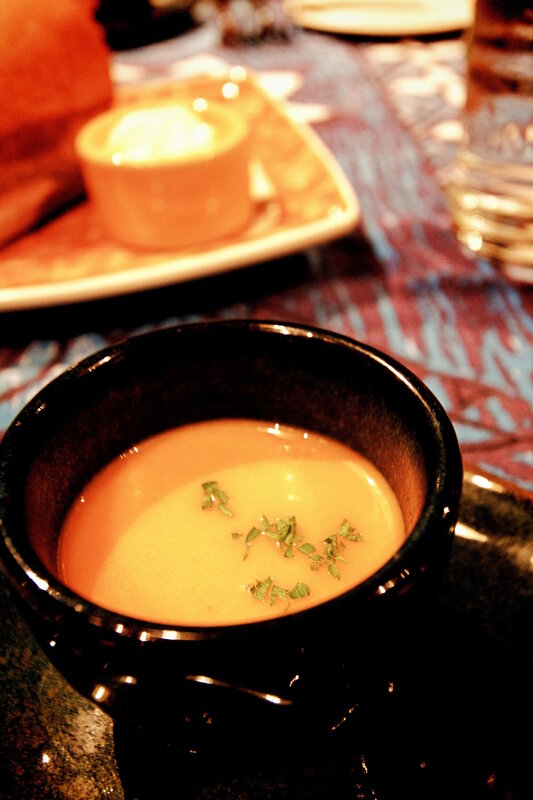 There were also many little surprises along the way that made it a memorable experience, like the welcome cup of soup from the chef, cold hand towels that smelled of tropical fruit and coconut pudding cubes to end the meal - all in addition top notch service. Mama’s Fish House is definitely not overly creative, nor does it push the boundaries of culinary greatness for all my foodie readers out there - they just serve good food in a cool setting to hundreds of Maui tourists a night (which is why it’s rated the #10 best fine dining restaurant in the US according to TripAdvisor reviews). Overall, I would definitely recommend Mama’s Fish House and would return again, being much better informed this time! Tips: dress casual to cocktail attire; make a reservation ahead of time; request a table by the window, but don’t expect to get one; bring a light jacket in case it gets windy; be ready to spend a minimum of $200 per couple. 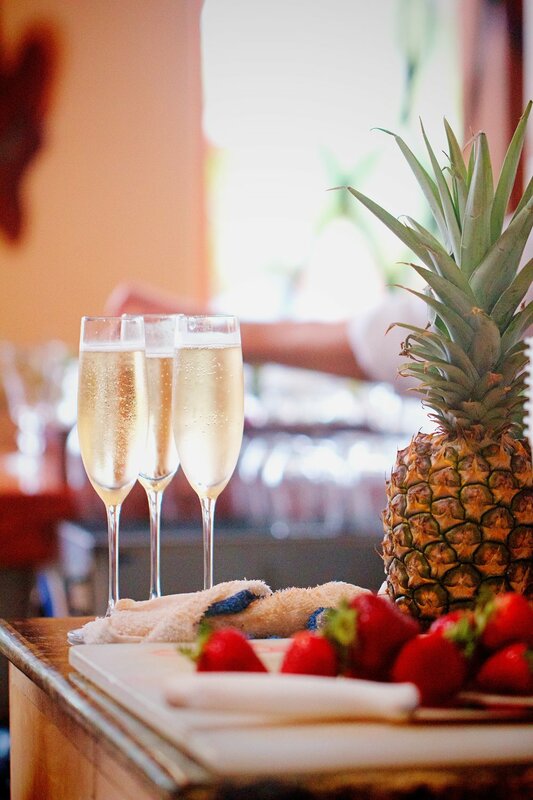 Merman’s Maui is a farm to table, fine dining restaurant showcasing fresh, local ingredients. This is actually the sister restaurant of the wildly popular south shore restaurant, Monkeypod. We ran out of time to visit Merriman's, but from what I understand it is just as good as Monkeypod which we really enjoyed, so if you will be staying north this is a great dinner choice to add to your itinerary. For a budget friendly option - check out their $75 pre fixed “to share” menu or show up for their daily happy hour from 3-5 with live music. 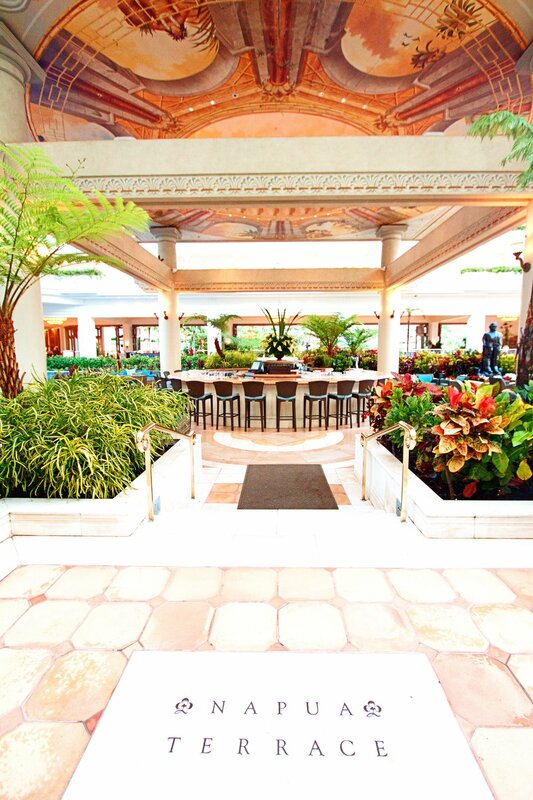 The Gazebo is a super famous, casual breakfast joint right on the shores of Napili Bay. This gem is tucked away on the edge of the Napili Shores Resort, a fairly random condo property where people start lining up at 6:30am - an hour before opening! So what would make people so crazy as to wake up early on their hard earned vacation just to stand in line? It’s all about the macadamia, white chocolate chip pancakes topped with homemade whipped cream and drizzled with coconut syrup. I mean - come on! There’s plenty of other great dishes on the menu like their fried rice topped with an egg and be sure to order my husband’s favorite drink - a POG (passionfruit, orange and guava) juice. Open daily from 7:30 -2pm, serving breakfast and lunch, it’s in your best interest to get here early or expect to wait in line anywhere from 20-45 minutes (no reservations). We arrived at 7am and still ended up waiting about 15 minutes after they opened, but it was totally worth it for a mouth watering, budget friendly breakfast. Oh, don’t forget your camera because the view of the bay is breathtaking and helps pass the time from waiting in line. Whether or not you are staying in a condo and can cook your own meals or you just want to pack a picnic, grocery stores have some of your best options. One of the most valuable tips we received from a friend who grew up on Maui was to hit the grocery stores for fresh poke and eat that as a quick and inexpensive lunch option. 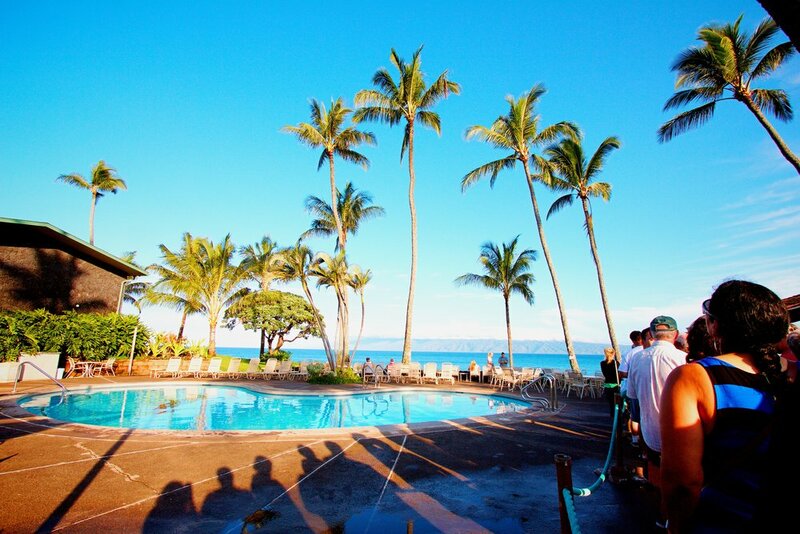 Here’s some places that we loved in Kaanapali. Times is a large supermarket right off the highway where you can get anything you need at lower prices than ABC stores and is open until 2am in case your flight gets in late and you are desperate for food or water. We also enjoyed their shrimp and ahi poke selection. 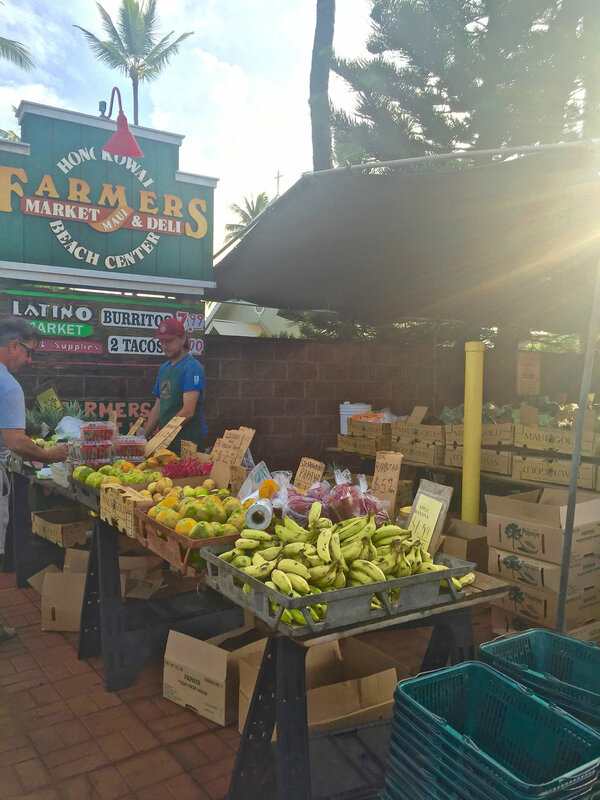 I walked to the Farmers Market Maui every morning while in Kaanapali. 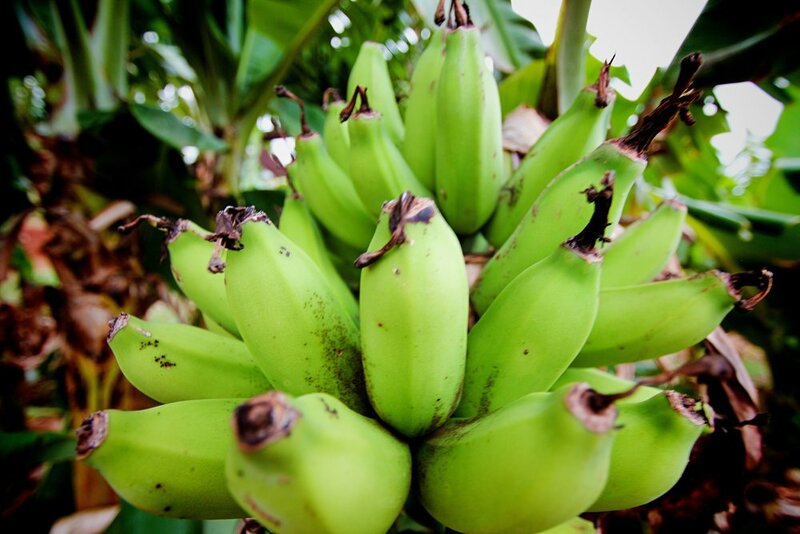 Not only do they sell an abundance of fresh produce, their baked goods like fresh banana and pineapple bread are crave worthy. A few mornings a week they have an outdoor market where you can get everything from fresh cut coconut, super yummy guacamole, salsas, honey and jam plus more samples than Costco on a Saturday. Keep in mind that the store is completely vegetarian and carries an abundance of organic goods, so you’ll want to head down the street for meats and larger box store type items. As you will quickly discover, there are plenty of shaved ice joints in town, but they are not all equally good. Ululani’s is by far the best that we found on the island. There really is nothing like it… don’t judge us, but we went two nights in a row and had to stop ourselves from going a third, which I now regret. Here’s what sets them apart from other shave ice spots - the Snow Cap which is a mixture of sweet cream and condensed milk as well as their coconut pudding ice-cream that sits under the shaved ice like a shiny present under the Christmas tree. You can get any flavor combo you want, but my favorite was the Haleakala combo - coconut and leche (not lychee) Snow Capped plus I add the coconut pudding ice-cream. 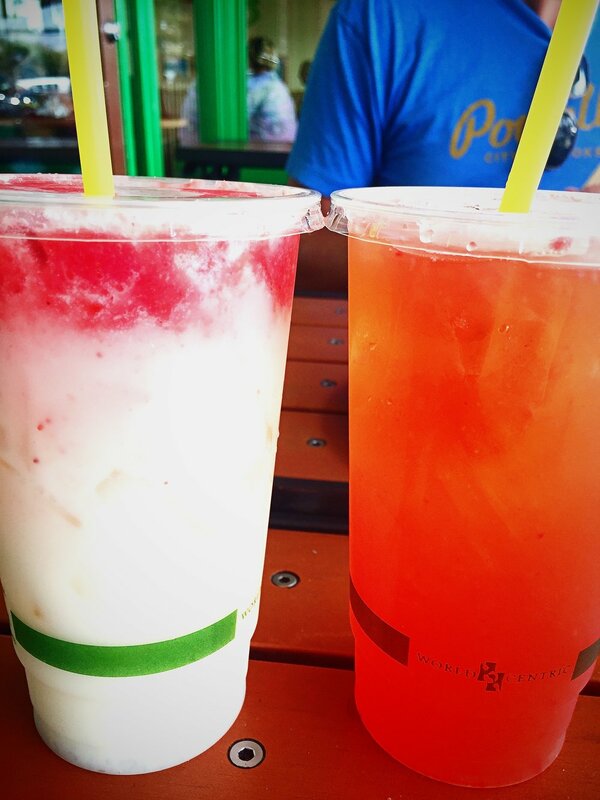 My husband likes bolder flavors and tried everything from passionfruit and guava to pina colada and Filipino lime, slurping up each one to the very last drop. Just so you know, I normally do not like shaved ice, at least the ones I’ve had that are icy and hard and made up of disgusting artificial flavors so I was not all that excited to try shaved ice when we arrived. Clearly I had never had real, amazing, heavenly Hawaiian shaved ice and have been tricked into trying other things of the same name. Take my word for it, do not miss this place! Fleetwood’s On Front is a recommendation that I regret missing out on. While I hear their food is good, it’s all about the drinks, happy hour and entertainment here. The happy hour menu is served from 2-5 daily, offering 50% off cocktails (I’ve heard from a reliable source that the Mai Tai is the best and strongest on Maui) and the menu items range from $5-12, including ahi poke, fish tacos and fried chicken and biscuits. In addition, there is a daily sunset ceremony at 5:45pm with either a Hawaiian Kumu or bagpiper (see both on Saturdays starting at 5:30) or come for nightly live music. Like I said, I regret missing out on all the fun. 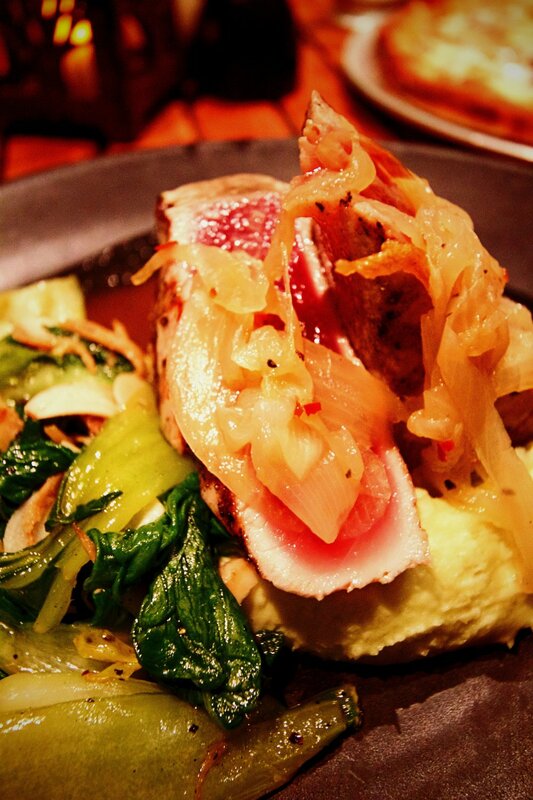 The Paia Fish Market serves fast, casual, fresh fish plates at reasonable prices. It's a good stop for both lunch and dinner. My husband loved his fish plate, but I made a mistake and ordered an ahi burger and hated it (I was expecting a nice, seared rare piece of ahi on bread, but instead it was cooked through and bland). So I’m not personally as enthusiastic about it, but based on the rave reviews from hundreds of happy customers I clearly did not get their best. Directly off of the Honoapiilani Highway you’ll find Leoda's Kitchen and Pie, this must stop pie and pastry shop. We were very strongly instructed to go here by our close friends and boy are we happy they were so insistent! First of all, it’s an adorable place with delightful staff who are enthusiastic about telling customers all about the day’s selection. We stopped here early in the morning on our way to the Road to Hana and decided to stock up on breakfast and lunch for the day. We ordered fresh baked cheesy biscuits, turkey pot pie (which takes about 15-20 minutes to heat so expect to wait or call head of time), a pineapple upside down cake and pineapple bread. Everything was baked to perfection - light and crumbly crusts, caramelized fruit, all bursting with flavor. Our only regret is not ordering more and not trying some of their cream pies (we were afraid they wouldn’t survive the drive). Not to worry, we will absolutely be back! The Mill House is a fairly new restaurant that’s only been around for the last year and still relatively unknown to tourists, but is surprising even the pickiest of foodies. Led by Executive Chef Jeff Scheer, The Mill House is pushing the island’s fine dining, culinary boundaries unlike it’s ever seen before. Using mainly the freshest, organic ingredients from its backyard on the Maui Tropical Plantation and sourcing quality, sustainable ingredients from Hawaii and beyond, this off-the-beaten path restaurant and bar is in a category all its own amidst the many mediocre, hotel upscale dining restaurants often found on Maui. Visiting The Mill House is truly an experience to be had - walking through the plantation’s many varieties of fresh fruits and vegetables, the bar’s unique craft cocktails, grabbing local goods from The Country Store, The Scoop selling homemade artisanal ice-cream and the coffee shop brewing grounds harvested from coffee grown on their own soil, not to mention the views of the Waikapu Valley are are just a glimpse of what this must visit destination has to offer. We arrived about an hour early (highly suggested) so that we could grab a drink at the bar and explore the property. 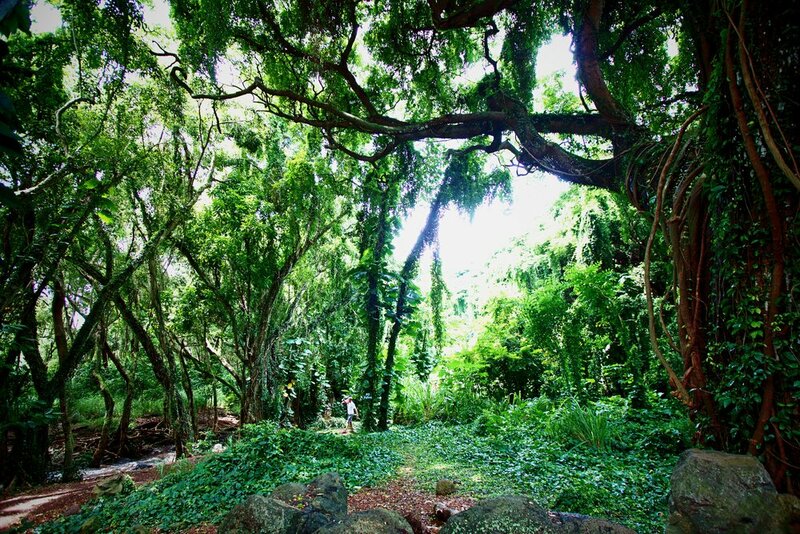 The plantation is located in central Maui - right off the highway between the airport and Maalaea (roughly a 25 minute drive from Wailea or 35 minutes from Kaanapali). Arriving was such a pleasant surprise from the beach scenery we were used to seeing; surrounded by lush greenery and the mountain range filling the background was breathtaking. The property of the Maui Tropical Plantation is rather large so it can get a bit confusing, but we parked and were quickly greeted and guided on the right path. Our first stop was The Mill House bar, adjacent to the main dining room of the restaurant, looking out onto the tranquil gardens of the plantation. Happy Hour is served 3-5 and their cocktails are some of the strongest and most creative I found on the island - clearly the bartenders take pride in their craft. I ordered a Mai Tai which gave me a buzz that lasted our entire dinner! Ok, I am also a lightweight. Next we toured the grounds of the plantation, weaving in and out of the isles of pink pineapples, banana trees, coffee beans, avocados, herb garden and so much more. We learned about the history of the land as well as the process of growing organic produce. Just being outside and looking onto the great divide of the Waikapu Valley was breathtaking and a vision I will not soon forget. Then we moved onto dinner. Seating is communal so we were seated with another couple who we did not know, but who soon became fun new friends as we shared our favorite food stories and discussed our backgrounds. On the edge of the room was an entire kitchen setup where the chefs were preparing our first course. We were greeted and encouraged to come around the “kitchen”, ask questions and take photos; this was meant to be an interactive evening where chefs and diners co-mingle. Chef Scheer was especially attentive with guests as they asked about dishes he was preparing and what his inspiration was for each item on the menu, providing a rare glimpse into the magic behind restaurant’s appeal. Once a course was plated and ready, servers would provide each diner with their dish and one of the chefs would explain it over the mic. Every tasting menu is completely different, combining the creativity and ingredients available each week so there’s no point in me tempting you with what each dish was - but I will say that as we worked our way through seven courses, each dish was even more tantalizing than the next. Everything from the alluring plating to the ingenious use of the unique, rich ingredients was exquisite and delightful. I was most surprised by the amazing dessert that was served, since I am often left disappointed at the end of the meal because of an overthought, underwhelming finish. But instead, the moist pastry with perfectly sweet and tart and was an ideal finale, complimenting the entire meal perfectly, only leaving me wanting more. I honestly cannot say enough about our evening at The Mill House - it was by far the best dinner we had on Maui and one of our favorite dining memories ever. We have traveled the world in search of great food and special experiences and this is now on the top of our list. Thanks to our gracious hosts, lovely servers and excellent chefs, we will dream about this night until we inevitably return again. Aloha Wow Wow Lemonade is just two doors down from Coconut’s Fish Cafe and creates some amazing lemonade combinations, made to order in mason jars, as well as acai bowls. I ordered a strawberry mint lemonade and it was exactly what I was looking for on a hot day to gulp down along side my grilled fish tacos. It was definitely a wow-wow combo! Monkeypod is the wildly famous south shore restaurant that everyone raves about, and I get why. Just a few minutes from all the major hotels in the area, people wait for over an hour just to get a table. With live music, farm to table Hawaiian fusion and cream pies to die for, it’s got everything you want for a night out on the town. 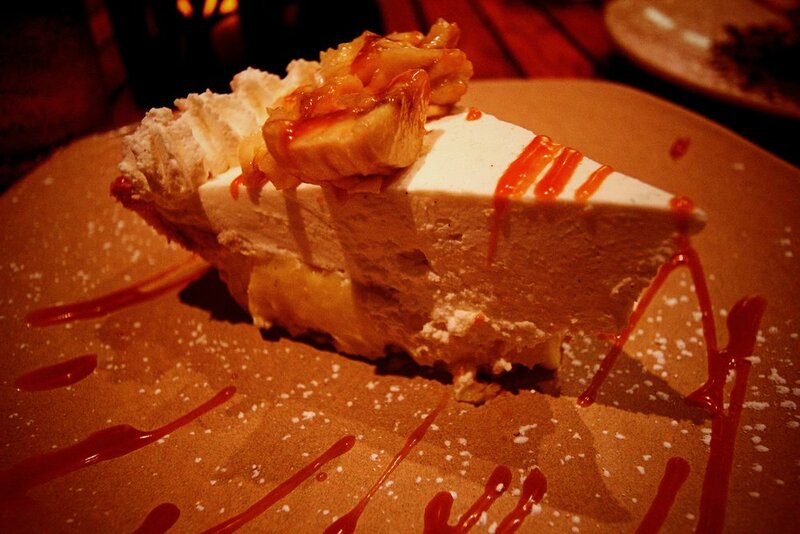 The ahi we ordered literally melted in my mouth and the banana cream pie caused us to consider ordering another slice. We also ordered the chocolate cream pie, which was not as good; next time I would try the coconut cream pie instead. They offer two daily happy hour menus, from 3-5:30 and 9-11pm, offering $9 pizzas, 50% off appetizers and deals on drinks. My suggestion, make reservations ahead of time because it always seems to be packed! If you are staying at The Grand Wailea, they offer a free shuttle service to and from the hotel - a good reason to drink up if you ask me. When it comes to what to do on Maui, options are endless. For our visit, I planned out a variety of activities for us to do daily, some that we managed to fit into the schedule and some we didn’t because we were too busy relaxing. I’ve listed the ones I chose based on my personal set of criteria - it can’t be too difficult, too hard to reach, has to provide good photo ops and is moderately adventurous - if this sounds like you then these options will be right up your alley. Locations are listed from north to south, ending with the Road to Hana. 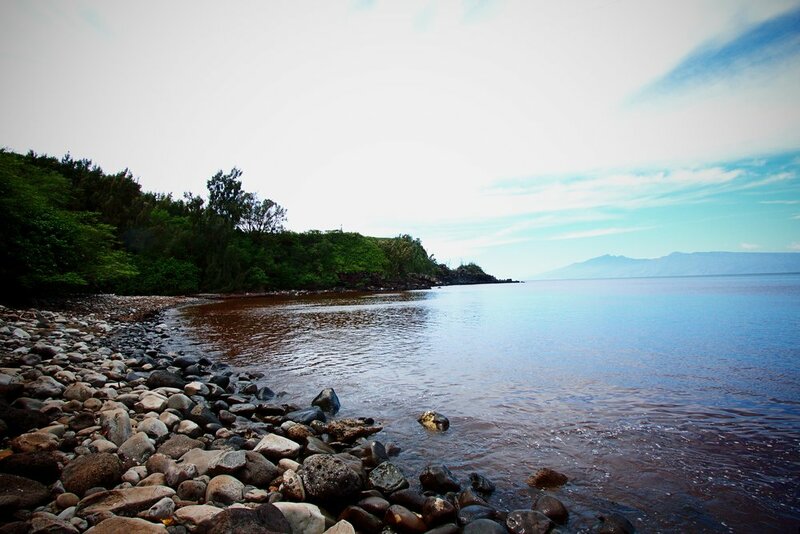 This is a famous snorkeling and surf spot along the northern coast. 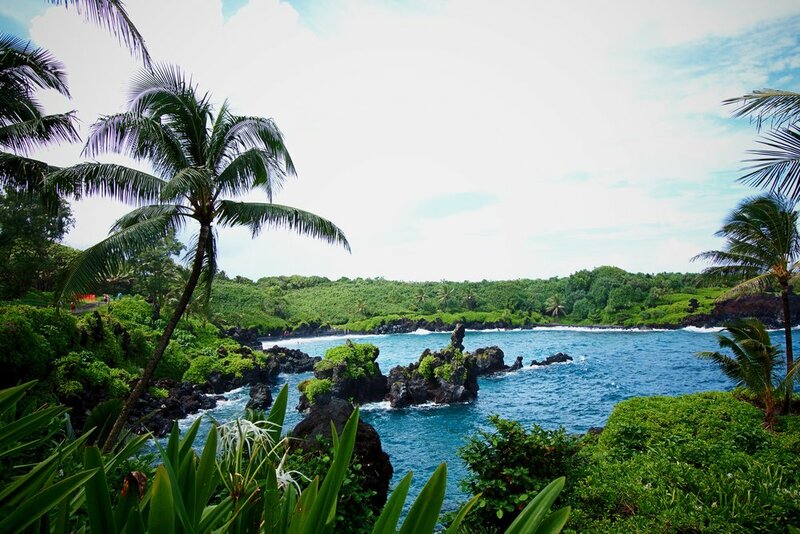 Honolua Bay's calm, crystal blue waters and perfect waves make it a popular place for tourists and locals alike. It’s not well marked, but as you drive north along the highway it’s on the left hand side just as the road begins to curve. You’ll want to drive beyond the many cars along the chain length fence and as you approach the bend you’ll see a dirt “lot”/area on your left (last photo below) and you’ll want to park there if you can. 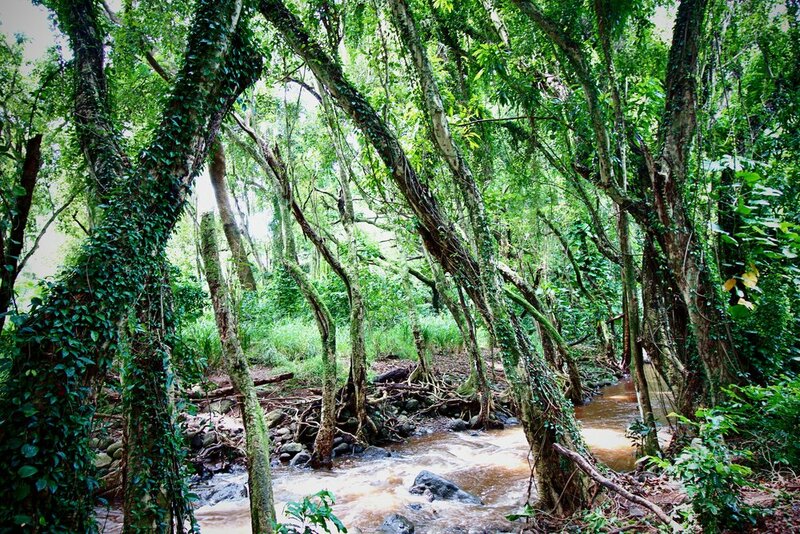 If you take the trail straight in from there, you’ll eventually reach the water - about a 10 minute walk through a super lush, tropical forest with wild chickens running around and a canopy of trees so thick at times the light barely peaks through. The walk was actually my favorite part. A couple important things to note: if it has just rained and the water is brown, you will definitely want to stay out of the water. For one, you won’t be able to see anything and two it’s when you can get really sick from runoff water. We arrived just after a major storm so were unable to experience the beautiful blue waters everyone raves about (normally the water is bright blue, instead of brown like my photo), but we enjoyed the journey anyway. Also, there’s a smoothie stand across the street from the parking lot in the open field - let me save you some money because it’s not worth it, we immediately regretted it as our smoothie was not so good. 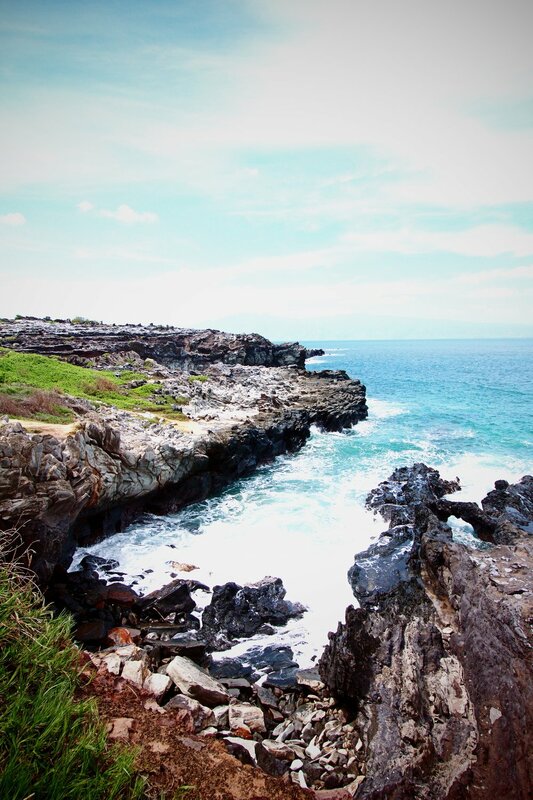 The Kapalua Coastal Trail is an easy scenic trail along some of the best beaches on Maui. 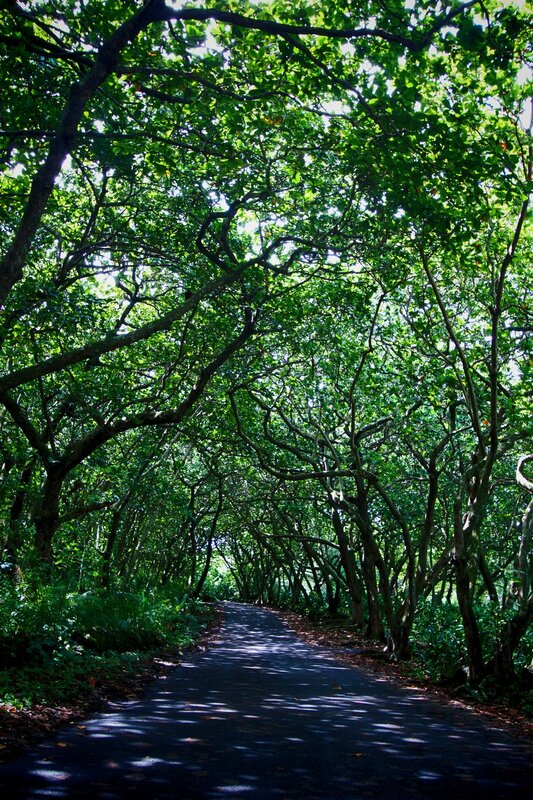 The trail goes from The Ritz-Carlton to Kapalua Beach Resort and is 3.5 miles roundtrip. With dozens of spectacular photo opportunities and pristine beaches alongside some of the best resorts on Maui, it makes for a fabulous afternoon. 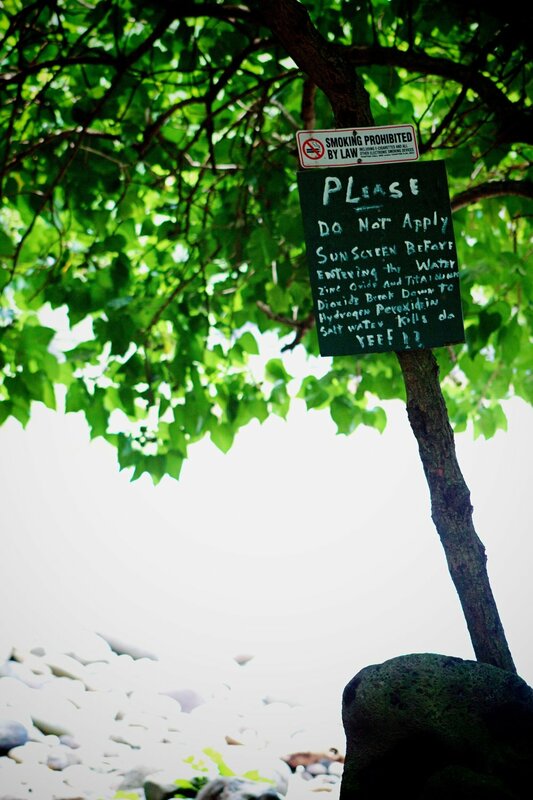 All beaches in Hawaii are public, which means that even if that beach is directly in front of a resort, anyone can use it. So don’t be intimidated by the big fancy beach umbrellas, just bring a towel and settle in. Kapalua Beach, next to the Montage, was where we swam for hours next to turtles and snorkelers in crystal clear waters. 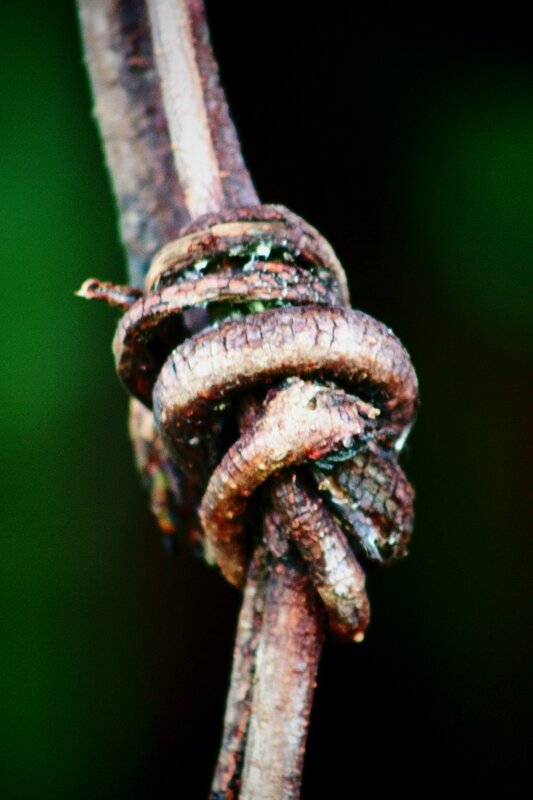 Now, the trail can be a bit tricky to find. We parked near The Ritz Carlton and walked down toward the trail… ask around and head in the direction of the water and eventually you’ll hit a boardwalk like trail along the coast. You can also start from the other end and try to park near the head of the Kapalua Coastal Trail. It will take you through various terrain ranging from paved paths, rocky steps (nothing difficult) and alongside luxurious resorts. For more, read this quick post by AFAR. For a bit more strenuous trail walks, the Village Walking Trails offer just that as you stroll along the trails of the old Village Golf Course. With overgrowth all around, tropical birds and hidden secrets, like a small lake stocked with ducks waiting for you if you make it to the end, make for a nice little adventure. There are two trail options, the Lake Loop which is longer and harder, about 4 miles total or the Cardio loop which is much shorter, but lacks the overall views and beauty of the Lake Loop. Whatever trail you take, there is quite a bit of uphill walking, more than I was ready for, especially with the humidity. Saying that, I saw more wildlife during this walk than I did the entire trip and it was good for sweating off some of those shaved ice calories I’d been accumulating. Again, this is kind of hard to find. If you park near the Honolulu Store, ask for directions there, then walk across the Kapalua Villas Maui along the golf green and be on the lookout for the double tunnels (north-east of the store), that’s how you know you’ve arrived. Don’t go too far unless you’ve reached these tunnels, otherwise you’re probably heading in the wrong direction like we did for way, way too long. If you are on the hunt for a quiet, uncrowded, but still white sand beach, head to Napili Beach. It’s not far from The Gazebo, so it’s the perfect place to swim and snorkel after a satisfying breakfast. 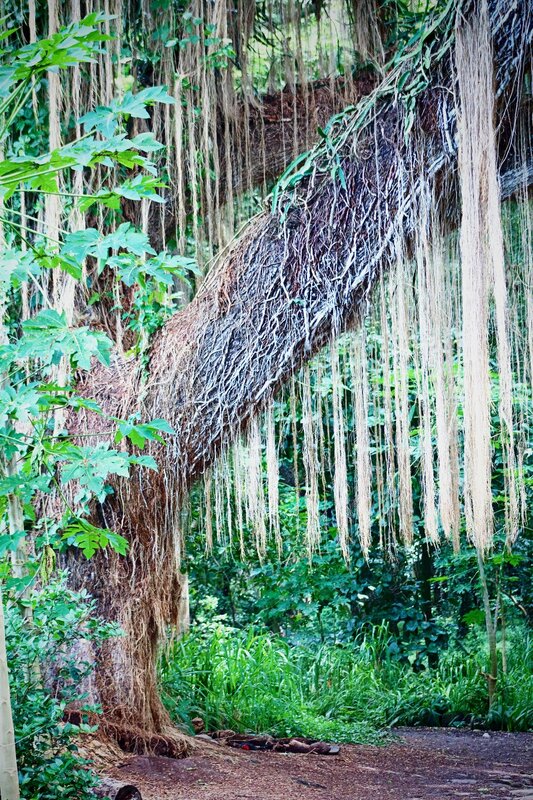 Banyan Tree Park is on the south side of downtown Lahaina and is an easy stroll through the park before or after dinner and an excellent spot for photos. The trees really seem larger than life and you can hear local artists jamming out on park benches. 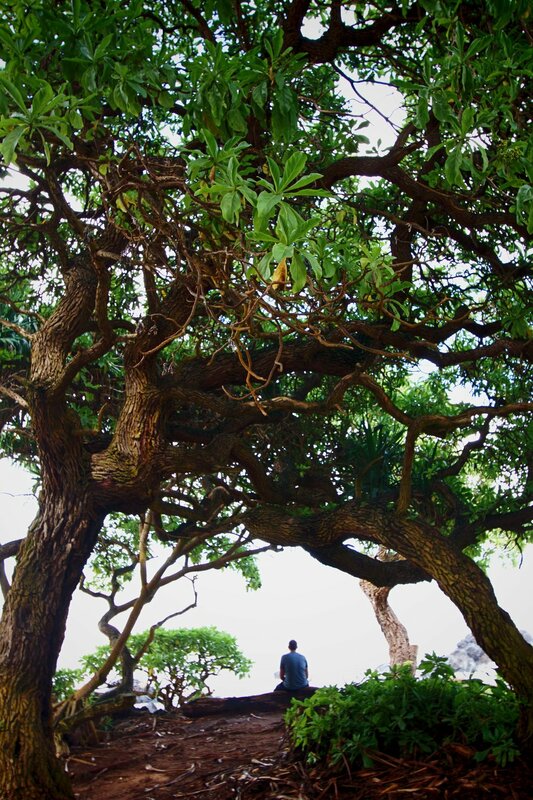 The Iao Valley State Monument is the spot of the famous Iao Needle, a half mile trail through the valley’s prolific vegetation to a scenic outlook. Located in central Maui, the best time to visit is in the early morning before dense clouds pour through the valley and visibility lessens. Just be sure to check online before going as it can close frequently due to heavy rains that may create road closures. Unfortunately, we did not make it here, even though it was on our list. Due to a heavy storm that came through right before our arrival, the area was closed. 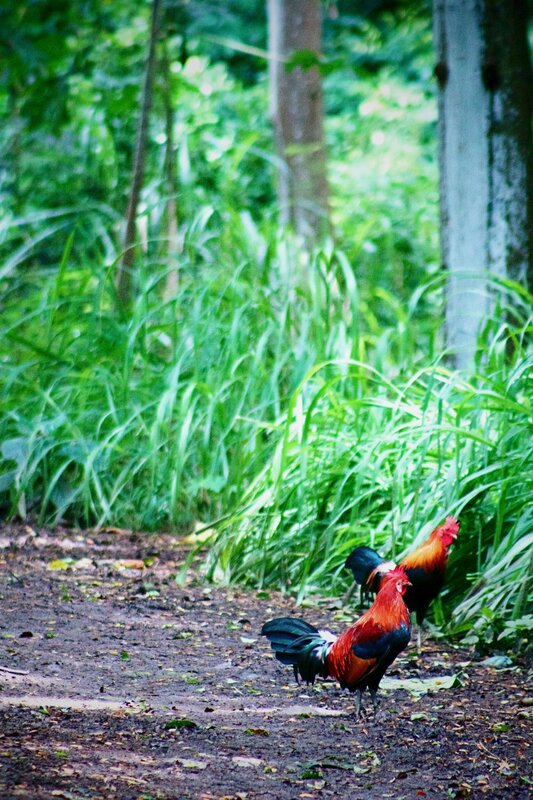 Driving along the Road to Hana was one of the most transcending times of my life. I knew very little about it going into the drive, other than that people talk about it like it’s the best thing since sliced bread. Well, it’s more like sliced bread covered with butter then sprinkled with cinnamon sugar. The drive starts east of the airport around Paia. It’s absolutely doable in a single day, but you’ll want to get started early - ideally arriving in Paia before 9am and expecting to return home sometime after dark. 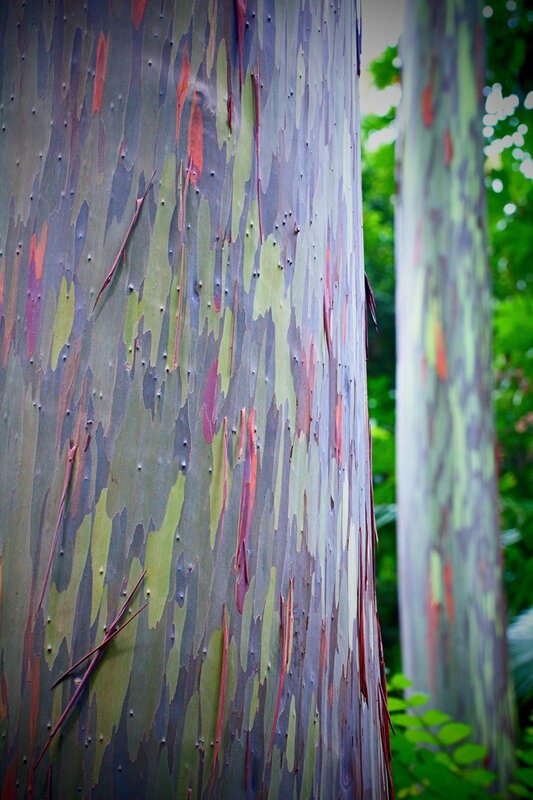 You’ll want to pack food and water as the options along the way are few and far between and I highly suggest bringing bug spray, especially for the trail to the rainbow eucalyptus trees as there are lots of mosquitos just waiting for unsuspecting tourists to sink their teeth into. 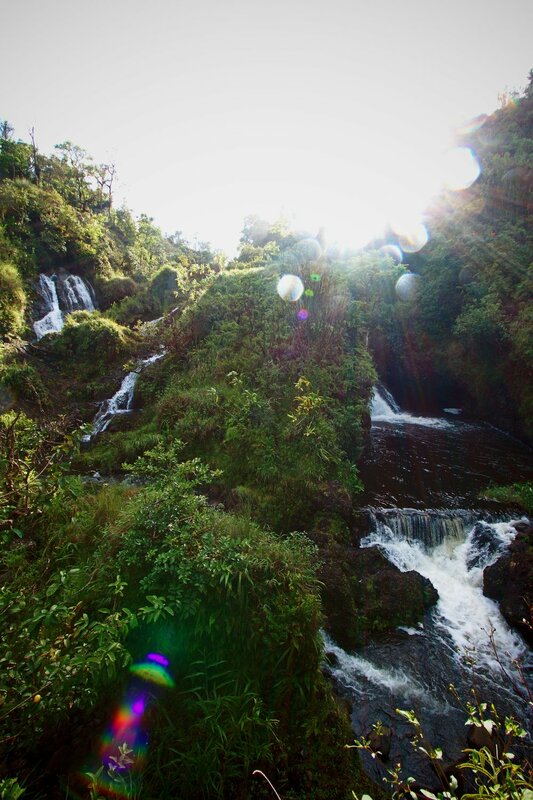 Here’s my best advice - download the Road to Hana Gypsy Guide app for 4.99 and you’ll have all the details you need to plan the best drive of your life. I was very much against getting an app to plan my drive since I’m normally my own planner (clearly), but it was the best money I could have spent. 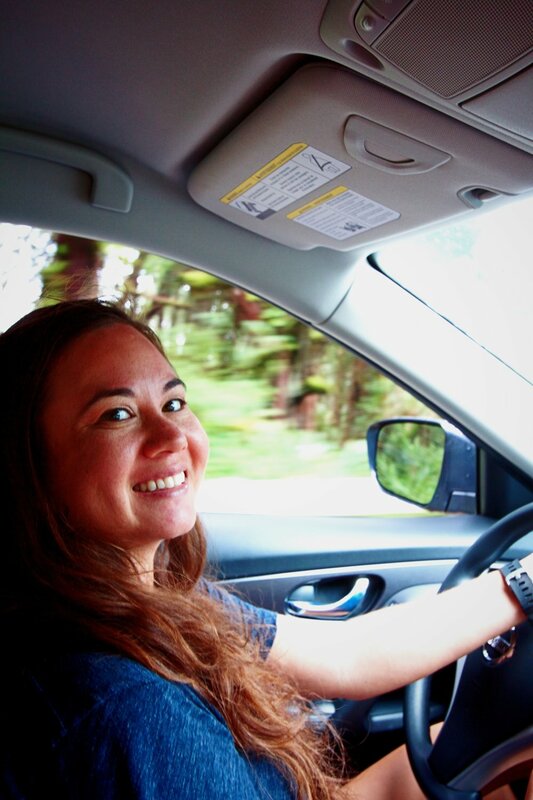 There’s no planning needed ahead of time, just turn it on during your drive (preferably just prior to Paia) and the excellent tour guide will provide you with all the advice you need along the way, including useful historical information. Tracking your every move by GPS, it knows where you are at all times, preparing you for stops ahead, what not to miss and what you're better off skipping. Otherwise, I would have been lost, just stopping anywhere I saw a group of cars and would have wasted a lot of time. Go slow and don’t be afraid to pull over and let people pass you. It’s most definitely a windy drive and can make you car sick if you take it too fast. If you're afraid of the drive, I would say that it wasn’t really that bad as long as you go at your own pace and get out of the way when local drivers start tailing you. Believe me, I'm a cautious scaredy cat when it comes to cliff drives, but I had little trouble winding my way along the mountainside after I calmed down, slowed down and didn't look down. Don't blast music too loud so that you can listen for trucks coming around corners - they will often honk when going around blind turns and single lane sections so keep your ears open. If you come to a one lane section - the person who arrived first has the right of way unless otherwise noted by arrows (the red arrow indicates which side must stop and allow the other side to pass). Always stop to look before proceeding just to be safe. Do not leave anything valuable in your car that can be seen, but preferably don't leave anything inside at all. There is a good deal of petty crime and thieves will stake out popular tourist destinations, watch you leave then break right in. We didn't have any trouble, but we were overly cautious so that we weren't easy targets. One stop I wish we would have skipped that was mentioned during the app tour was The Garden of Eden Arboretum - it’s $15 per person and a total tourist trap. Yes, there are are an abundance of plants and walking trails with views, but nothing more than you would find for free along the drive. Partially we stopped because we thought it would be our only bathroom break for a while, but there is a public rest stop less than 5 minutes beyond this point, so just keep going. When you are driving through Hana make sure you stop at the random roadside popsicle stand - Shaka Pops near the Hana Ranch store. We stopped on a whim and we were so glad we did. There are so many gourmet flavors to choose from, that it is hard to pick just one. I got the strawberry lime pop and it was fantastic… we almost stopped for another one on the way back they were so good! 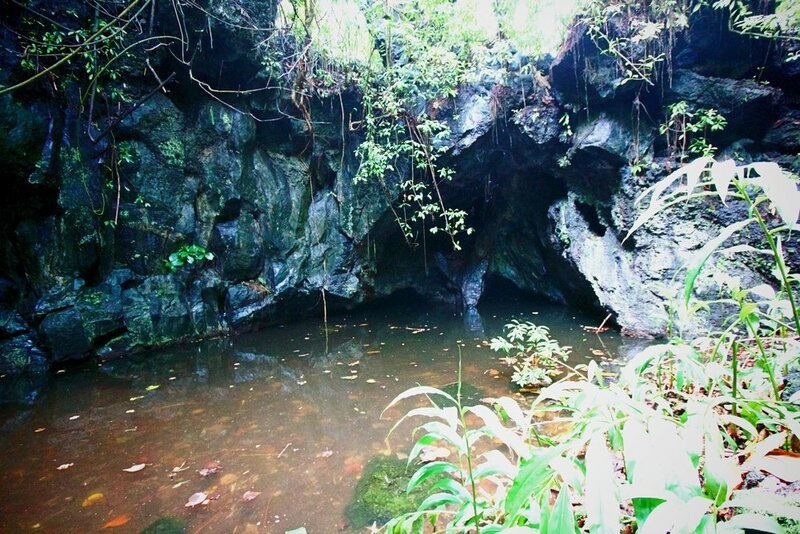 Beyond Hana are two more stops that you have to visit, Wailua Falls and the Seven Sacred Pools. Unfortunately for us, the Seven Sacred Pools were unreachable when we went due to the recent storm; however, Wailua Falls was the highlight of our journey. What made it so special was that we didn’t just stop to take photos of the falls like most people, we trekked over the rocks and jumped into the pool at the base of the waterfall. Now, if you know me at all by now, you know that heights and adventure aren’t really in my bones and I almost didn’t do it at all - but I sucked it up and ended up absolutely loving every second of it. The water is cold at first, but you get used to it quickly and get lost in swimming under the falls. I can’t recommend this enough - if I can do it, I promise so can you. If you can time it right, try to beat the sunset back so that you can watch it go down over the shores of Paia during your drive home. But don’t rush it, you can always catch the sunset at another time. As I mentioned before, once you hit the Seven Sacred Pools, that’s where you’ll want to turn around and head back rather than continuing the drive toward Wailea. While some people do choose to do the drive, there’s about 20 miles of off roading, there’s nothing and no one around if you get stuck and it will add a minimum of 20 minutes to your drive. For those reasons we chose not to risk it and turn around. Finally, I recommend stopping where you want on your drive toward Hana rather than on your way back because you’ll most likely be too tired to actually stop as you crawl sleepily toward home. I really tackled with whether or not to attend a luau during our trip. In our travels, we've done quite a few cultural dinners - some better than others and I'm never all that impressed by them. I'd heard mixed reviews from a lot of people, the main concern being that the food is pretty mediocre and it's one of the most expensive tourist attractions on the island, ranging from $100-150 per person. In the end, we opted to skip the luau and spend our money on a nice dinner - which is why we ended up at The Mill House and I'm so glad we did. Now if you really want the total Hawaiian experience, you should probably attend a luau, just know that you're going for the entertainment - not incredible food or strong drinks. But if I were you, I'd skip the luau and get your cultural fill in nature and by visiting some of the island's authentic, family run establishments instead. Finally, I'd like to thank all of the friends and family who graciously offered up their recommendations and best kept secrets, helping to make this awesome guide possible. Cara, Megan and Jess, major thanks to you for taking time from your busy schedules to provide me with very long, type-a lists of locations and Kyle and Esther who told us about some of our favorite restaurants on the island. If you have any questions regarding any of the places I talked about, don't hesitate to reach out to me, I'm always willing to help. Mahalo & happy travels my friends!